Automatic garage door openers are a great convenience. Not only do they allow you to quickly gain access and entry to your home, but they also provide a shelter for your vehicles and other investments that are stored inside your garage. Typically, garage door openers are highly reliable, which is why many homeowners become frustrated when they have a malfunctioning or broken garage door. Fortunately, many garage door opener issues can easily be fixed on your home. If your garage door opener is not responding to the remote in your vehicle or the button on the wall, more likely than not, it is because the machine is not receiving power. To fix this, inspect the motor plug to make sure it is properly inserted. If that doesn’t fix the issue, check your home’s circuit breaker to see if the issue lies with the fuse. If your garage door opener is battery operated, the solution may be as simple as swapping the batteries. Is your garage door reversing when closing? No matter how many times you try, the door lowers, only to rise back up once it reaches the halfway point. While this is a frustrating problem, the fix is quite simple — all you need to do is adjust the close limit. Most garage door openers will require a screwdriver to adjust the garage door close limit located on the main track. Modern garage door openers feature adjustable knobs on the motor itself. Experiment until you find the appropriate length for the door to travel to close. Still having issues? Contact a garage door opener repair company! If your garage door will not open all the way, in this case, your limit is set too far out. When this occurs, your door will hang over the entrance. If you have a manual limit switch, move it closer toward the motor. This should fix the issue, allowing your door to open all the way. If your garage door isn’t closing all the way, check your safety sensors. It is possible that they have become blocked or misaligned. If the problem still exists, the close limit will need to be adjusted, as mentioned above. 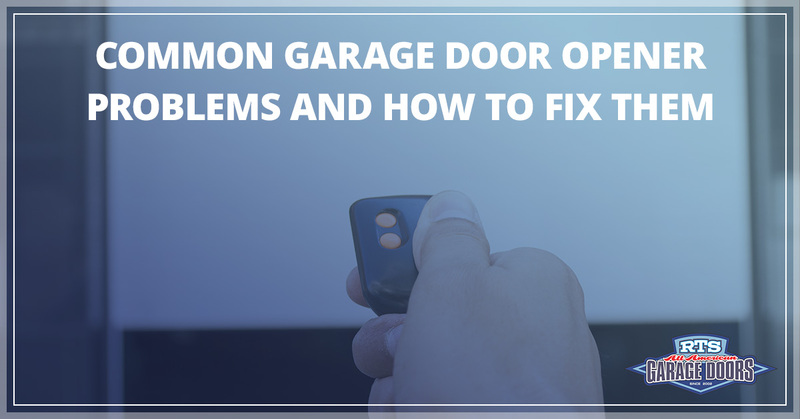 If you are wondering, ‘Why are my garage door lights flashing?’, it is likely because your opener is trying to communicate a problem. In this case, refer to the manual for identification. If you can hear your unit working, but the garage door isn’t moving, check the main track for any obstructions by pulling the manual release. See if it becomes stuck while you open and close it manually. If the door moves smoothly, the problem is likely with the motor itself. If your garage door opener isn’t working and you cannot figure out why, contact the team at RTS All-American Garage Doors for garage door repair in Pensacola!